The 2019 NFL Draft is loaded with Day 2 running backs—ball-carriers who aren’t sure enough bets to go In Round 1, but who could (if things fall the right way) become starters at the NFL level in relatively short order. 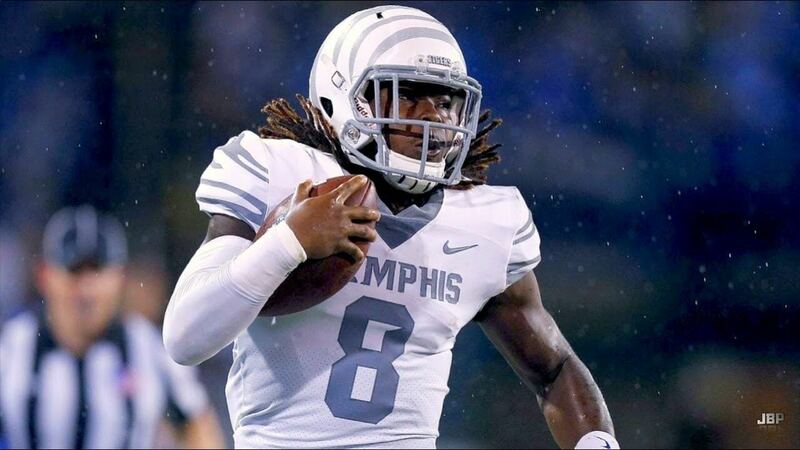 Among those Day 2 talents in the backfield, you won’t find a more explosive talent than Darrell Henderson of Memphis, a 5’8″, 208-pounder who led the FBS with 1,909 rushing yards last year and averaged just under nine yards a carry. As Doug Farrar wrote for Touchdown Wire, that jaw-dropping per-touch average was no aberration. “That astonishing 8.9 yards per carry average was no fluke, either – in 2017, he gained 1,154 yards and scored nine touchdowns on just 130 carries, averaging the exact same expanse of field every time he touched the ball,” Farrar said. The first overall pick in dynasty rookie drafts may be pushing it barring a dream scenario—like Henderson landing with a team whose offense suits his skill-set and who would offer a clear path toward a significant workload early in his career. It’s just as likely—if not more so—that Henderson will land with a team that would use the youngster as more of a committee option, at least to start. Henderson also doesn’t have the highest fantasy floor of this year’s rookie backs. There are valid concerns, whether it’s Henderson’s size, lack of vision when running between the tackles or lack of pass-protection skills. With that said though, Henderson’s explosiveness is undeniable—explosiveness that portends a fantasy ceiling that could well be the highest of any tailback in the Class of 2019. If Henderson is able to work on those weak spots and comes close to realizing his immense potential over the first couple years of his NFL career, the sky’s the limit. He could be much more than just a weekly fantasy starter. He could be a stud. And that sort of upside can be hard to pass up on draft day.